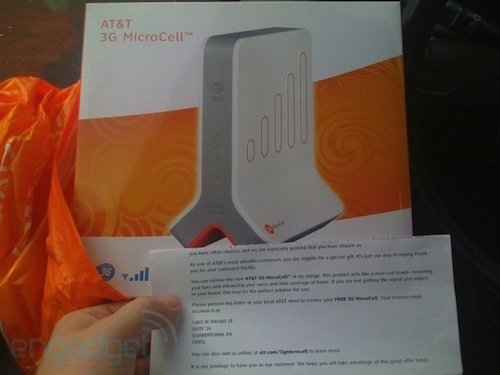 Engadget reported over the weekend that some of AT&T's "most valuable customers" have been receiving offers for free 3G MicroCell devices, which recently went nationwide after being tested in limited geographic areas. The 3G MicroCell taps into a user's home broadband Internet connection, routing voice and data over the customer's own connection to provide enhanced coverage in areas with weak cellular signal. Carrying a $150 list price, the MicroCell can be used with a customer's own cellular plan minutes for no additional charge or customers can purchase additional MicroCell minutes for a monthly fee. While we've no clue how widespread AT&T's generosity is, or how you might get one, it appears that the company's "most valuable customers" are now receiving free range-boosting femtocells. Today, loyal reader Jason got a old-fashioned paper letter in the mail, offering his iPhone-wielding family a 3G MicroCell with no strings attached. Speculation has suggested that customers being signaled out by AT&T for the offer are high-value customers with substantial monthly contracts that are nearing expiration. The MicroCell offer could then be considered an enticement to convince those customers to re-commit to AT&T for a new contract term. AT&T has reportedly claimed that the free MicroCell offers are part of a trial the company is running to test various methods of offering the device. As Engadget notes, "free" is usually a pretty good method, although the company has provided no additional information on how it is selecting customers for the trial offer.